Brushing off loose dirt and other surface stains with a gentle soft-bristled brush. An extra mild cleaning solution to protect fabrics is added without damage to the fabric's color or fiber quality. Rinse thoroughly until all soap residue is completely removed. Tents are inspected prior to cleaning. Any rips or tears are reported to customers prior to cleaning services. We will gently and safely remove all stains and deposits from your tent using the appropriate cleaning solution to protect & prolong the lifespan of the fabric in your tent. Service assign either on site, arrange for pick up or drop off. First, an inspection of the furniture to determine fabric type and to identify any areas of concern. Next, an application of our furniture cleaning product is used to break up any embedded soil from the material. More difficult areas receive extra attention by gently brushing our cleaner into the fibers. Our expert cleaning process not only freshens the look and feel of your furniture, when cleaned regularly, your furniture will last longer. ​It may seem tedious, but cleaning out your gutters protects your home against expensive damages. Such as: rotting woodwork, and cracked foundations! Gutters are made to re-direct the flow of any water off your roof and away from your property. When the gutters are clogged they do not drain the water efficiently away from the structure of your home & business. This can potentially cause costly repairs to your property. We recommend getting your gutters cleaned at least twice a year. LC Cleaning makes sure that your gutters are free of all debris and that your downspouts are free flowing. We provide building washes for both residential and commercial properties. Washing your building needs to be an integral part of your regular maintenance. The accumulation and build up of dirt on a building from air pollution will accelerate its deterioration. Part of our washing services, you will see that our team take advantage of biodegradable cleaners, soft brushes and high pressure water spray to restore your building’s siding to look like-new condition. Also, Using a boom-truck, we can clean any part of a building without scaffolding. The boom-truck can extend up to a height of a 5 story building - allowing us to get at even the trickiest of unwashed areas. Allergens, dust mites, dirt, and pet dander build up in carpets over time, leaving them grimy and discolored. Our two-step, professionally-recognized carpet cleaning system can extract dirt, remove stains, eliminate odors, and restore color, leaving your carpet looking and feeling fresh. A special heated carpet cleaning solution is sprayed deep into the carpet fibers to loosen embedded dirt. It’s followed by a high-powered extraction and pH-balancing fiber rinse to remove the dirt and cleaning solution, leaving your carpet as clean as it can be. Steam cleaning is very beneficial in maintaining cleanliness to your home or business. This high pressure process can remove all surface stains such as gum, mildew, tire tracks, oils stains etc… with or without heat, it can be done! First, an inspection of the furniture to determine fabric type and to identify any areas of concern. Next, an application of our cleaning product is used to break up any embedded soil from the material. More difficult areas receive extra attention by gently brushing our cleaner into the fibers. Our expert cleaning process not only freshens the look and feel of your furniture, when cleaned regularly, your furniture will last longer. ​The appearance of your exterior is crucial to maintain a good impression on your customers. We can help to maintain your sidewalks, parking lots, drive-ups and perimeters impeccable. Either day or night, we can schedule at your convenience in order to not interfere with daily business or your customers. LC Cleaning Service's cleaning technicians are trained in efficient, thorough cleaning. We use the best tools for the job, like high powered vacuums, microfiber cloths, and safe, effective cleaning solutions. We are happy to clean your home while you are out or while you are in. It's your preference, and we are happy to schedule cleaning times that are convenient for you. ​LC Cleaning can help you keep those high traffic areas looking beautiful while extending the life of your floor. Dirt and grit can damage your floors permanently and cause unsightly and unsafe scratches and nicks; let us strengthen your floors. 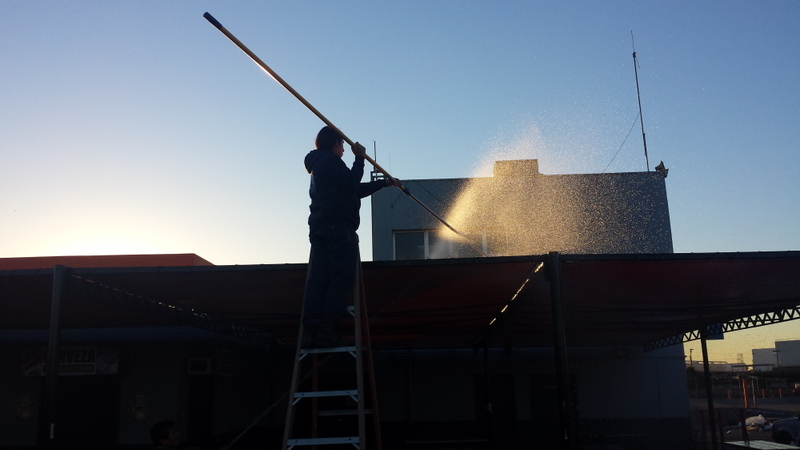 Apply a sealant and protectant to enhance your awning's appearance and extend its life expectancy. The treatment has been designed especially for Awnings and Tents and has been approved and recommended by leading fabric manufacturers. It contains UV blocking agents and other formulas to help protect the fabric against damage caused by sun, mildew, and pollution acids. This is a vital step in maintaining your investment. It will significantly increase the life span of the material. If unwanted birds or pigeons are roosting in areas of your business, you already know what a nuisance it can be. Aside from the overall noise and distraction, unwanted avian guests leave heaps of droppings, feathers, and debris which are unsightly and unsanitary. These droppings are often carrying masses of diseases and can pose as serious health risks. Hot Foot – Discourage birds from landing, roosting or perching! Perfect for ledges, gutters, buildings etc. Bird Spikes – Plastic spikes which are installed to a ledge or any flat surface. They prevent the birds from being able to land on those areas.